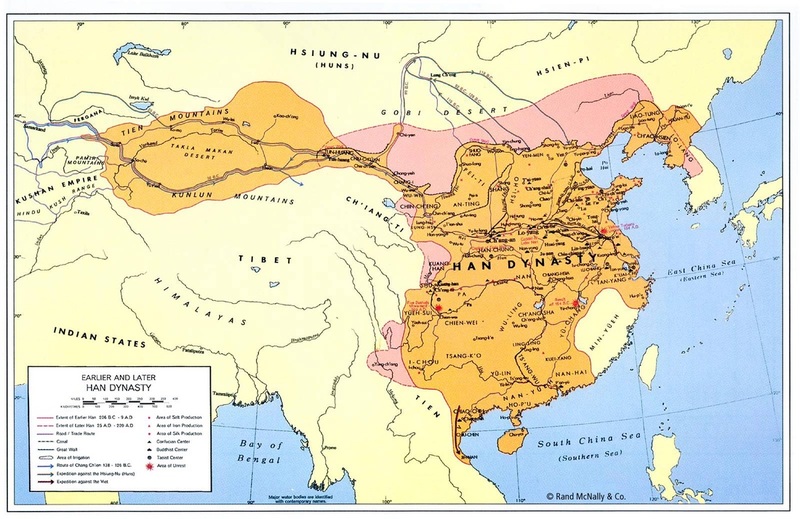 The Han Dynasty was one of many significant dynasties in ancient China; it took place during a time of increasing prosperity. The Silk Road was created during this dynasty and was a great way for merchants to gain wealth. Merchants in the Han Dynasty depended on the Silk Road which was where they traded for luxury items. Life for merchants was not easy because they were not respected and they were ranked the lowest as their social status. The economy of the empire depended on their bestselling products, iron and salt. The production of silk and copper are some activities that also contributed to the economic wealth of the empire. Merchants traded silk and paper (which were invented during this dynasty) because it was a popular product among the foreign traders. Merchants that originated from the west, traded horses, furs, ivory, and jade. This west silk route enabled them to acquire new items like cucumber, sesame, and alfalfa. Traders also exposed them to new skills like using grapes to make wine. "But perhaps the greatest contributor, to the Han dynasty economy’s affluence was the silk trade and the opening up of the Silk Road." The image above portrays a Chinese merchant trying to bargain his silk for the porcelain vases.